An original letter of correspondence between brothers and business partners Joshua Coffin Chase and Sydney Octavius Chase. Topics discussed in the letter include the unsatisfactory piece system for packing at Isleworth Grove, insufficient wrapping and packing of fruit, paying packers on a day basis, and decreasing expectations for productivity. Original letter from Joshua Coffin Chase to Sydney Octavius Chase, December 1, 1927: box 49, folder 20.84, Chase Collection (MS 14), Special and Area Studies Collections, George A. Smathers Libraries, University of Florida, Gainesville, Florida. 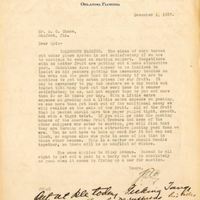 Digital reproduction of original letter from Joshua Coffin Chase to Sydney Octavius Chase, December 1, 1927. Chase, Joshua Coffin. 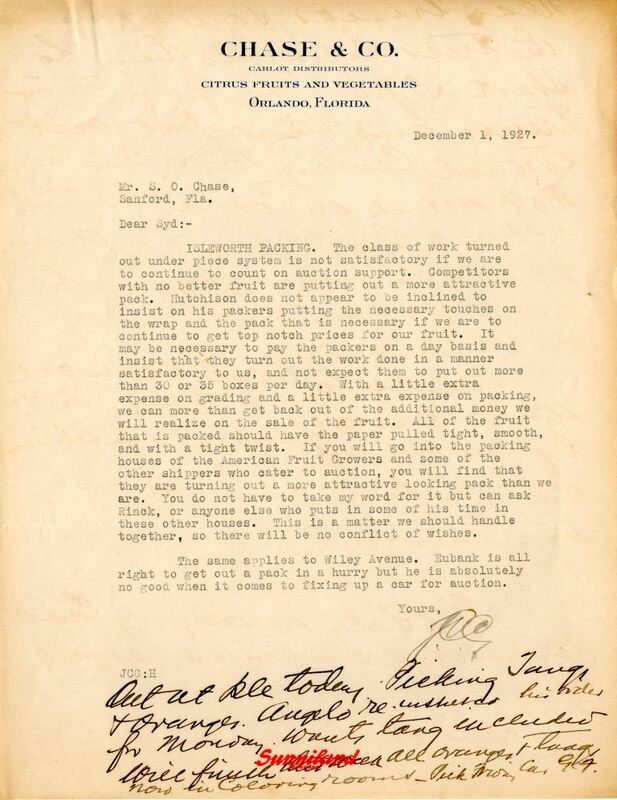 “Letter from Joshua Coffin Chase to Sydney Octavius Chase (December 1, 1927).” RICHES of Central Florida accessed April 26, 2019, https://richesmi.cah.ucf.edu/omeka/items/show/2707.